What Example are You Setting with Baby’s First Bunny Bank? My wife and I got invited to a Christening the other day. In fact the Dad might even be reading this post. (If you are reading, G, we aren’t likely to make the 3,000 mile trek. We will be doing Relay For Life). Anyway, we wanted to send a gift for the new baby. In fairness, it wasn’t really a “we”, I often outsource these tasks to Energi Gal (thanks Honey). 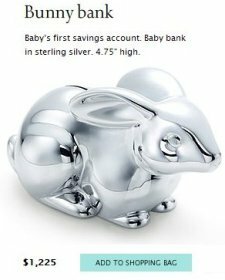 During her search she came up across this item… Tiffany’s Bunny Bank – Baby’s first savings account. The $1,225 price tag sure is a lot of savings. If that money was invested and it earned 6% a year (not an unreasonable amount after taxes, inflation, and investment fees), it would be worth more than $54,000+ in 65 years. That’s real, spendable money in today’s dollars. If he uses the money when he’s 80, he could go on a spending spree of $129,600 (again in today’s value of dollars). I get the feeling I know what Cap would say about this purchase. Is this just something for the rich uncle to buy? I just love the irony behind this product. While I value silver as an investment / alternate currency, I can’t make sense out of this one. For the price to make sense from a silver investment standpoint, considering troy oz to regular oz, and sterling silver to fine silver, this thing would have to weight right about 5 lbs to be a good value. I’m doubtful that we’re looking at 5 lbs of sterling silver right there. So we’ll leave this one to the super-rich, who don’t really have money concerns. Their children will likely be trust-fund kiddies in any case, so money won’t be a concern to them either. Perhaps you could view it as an investment in whatever metal the bank was made from? Whatever happened to old pickle jar w/ a hole in the lid? it’s funny that the bank will be worth more than what could ever possibly be put inside…. Llama Money: There’s a name and a brand behind this silver. It’s also shaped in cute form. I just punched out my monitor after seeing this POS. You owe me a new LCD monitor? Cap, I have a spare one that’s just taking up space. Let me know next time you are in NorCal. The purpose of the piggy bank is to teach and instil good habits and life lessons. It is not to save money per se. My guess is that only multimilinare households will buy this item. It doesn’t matter if they spend $1K on this item. In the greater scheme of things, their life budgets are unaffected. If they wanted to nickle and dime everything because it will be work 50K or 100K at retimrement, such people would never be able to spend any of their wealth. They would be forced to live just like middle class or poor people. Money is important. But there is minimal diffrence between having 7 million at retirement and 8 million. You can’t take the money with you to the grave. And second, the buying power of money decreses with age. You simply can’t wait till retirement to actually start doing things you’ve always wanted to do. Some things are much more enjoyable when you’re 20-something and 30-something. dc-publius: If multi-millionaires buy them, then I’m okay with it. I know some people that get emotionally attached to giving the baby the best of everything and they would include this bank in that. They are not multi-millionaires. Is there more enjoyment to this item at age 20 or 30? Sounds kind of difficult to say. You don’t need to take money to your grave, you can always leave the money to your children. Even multi-millionaires sometimes run into hard times. Remember, MC Hammer went from millions to bankrupt. Others have as well. I’m not saying that things aren’t worth spending for today. A trip to Hawaii when you are 30 might be one of those things. I just wonder if this bank is one of them. That irony is funny. I guess if you can afford that you don’t need to worry about retirement. On another note, I think it is critical to expose children to saving and investing at a young age.